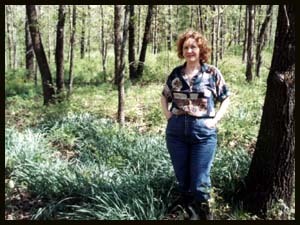 Me standing by a used to be grave in the old Miller Cemetery 4-18-1999 We found this old cemetery remains today. I was so glad to find it. I had heard where it was but couldn't go down in there until ticks and snakes are gone. We were cutting it pretty close today though! 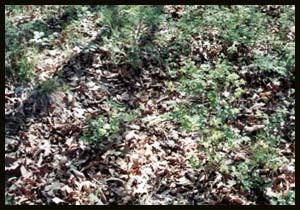 We came back to this old cemetery in Jan 2000. 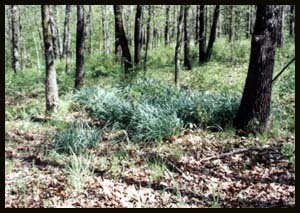 The Daffodil flowers are surrounding the grave area A short distance on down the hill and across a small creek that runs into Big Greenleaf creek, is the old original Greenleaf cemetery. See the web page on it next.